She took home the Oscar for her role in Dreamgirls. 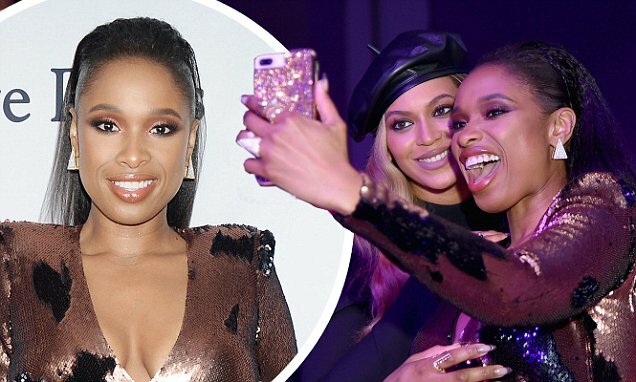 And Jennifer Hudson looked every inch the movie star as she was spotted hugging Beyonce - her co-star from the 2006 musical - in New York on Saturday night at the Clive Davis Pre-Grammy Gala. The 36-year-old entertainer dazzled in a bronze sequined gown as she paused to take a selfie with the Formation superstar. Jennifer won the Best Supporting Actress trophy for portraying Effie while Beyonce played lead Deena as they formed a musical group call the Dreamettes. Meanwhile, at the Clive Davis Pre-Grammy Gala, Jennifer dared to impress in her body hugging couture. Her ample assets were put on center stage as the sensational number was low cut and plunged at the neckline.